Karinyas has modern cuisine, featuring fresh local produce through its seasonal a la carte menus. 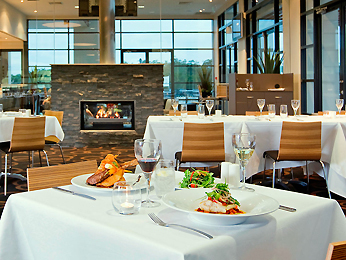 The restaurant is open daily for all meals.Overlooking the picturesque golf course, it has an extensive wine list which including wines from local wineries. All four of us at dinner loved every course we had, from entree to dessert . A beautiful spot. Great service, great food! Great service from all staff.Thank you. We're frequent diners at Kooindah but our meal this time was so dissapointing I don't think we'll be back. $4 for a single slice of bread and our mains were very ordinary. 4 x $45 steaks which to be fair,  were cooked perfectly, but unfortunately two of them were poor quality and very tough. The steaks each came with half a boiled potatoe that was undercooked and a sort of paste rather than jus which made the meals rather dry. The fries ordered as sides were nice though. Overall not too happy and we were a little embarrassed because we'd been telling our dinner guests how nice it was. I had both dinner & breakfast Karinyas. I could not have received a warmer welcome & professional service from everyone there, but in particular Helena, Cheryl & Jasmine. There was no push & shove here from anyone to get on my way. They were rushed off their feet but still shared their valuable time with us with focus & pride that they were fulfilling their duty of care for the guests. I could not have asked for more. I will return to Mercure Kooindah Waters. Food was very nice, service was very friendly but the staff seemed to be run off their feet. There didnt seem to be enough staff working. Had to keep asking for my water to be re filled. We were asked for dessert but noone came to take our dessert order. There was a large group in so maybe more staff needed to be rostered. We had a wonderful waitress Gloria who made our night great. Her service was excellent, the restaurant was fully booked but the service and timing of our meals were extremely good. It’s amazing what good service adds to your evening. We were pleasantly surprised compared to the last time we were there several months ago. The place had been renovated and ambience fantastic; the menu (thank goodness) was so much better and everything we ordered was enjoyable. The staff were fabulous despite being quite busy. We’ll definitely be bringing our guests more often as we live just around the corner. Again very disappointed ☹️. We booked over 1 week ago for 9 people. I received an email the day before asking too confirm my booking. Which I did confirm. We arrived at restaurant and they had no booking in the book. There was no table reserved for us, there was no table ready for us. The young waitress was extremely efficient and apologetic. She then had us wait in the middle of the restaurant whilst she put tables together, moved chairs then placed cutlery and napkins etc. The waitress was very efficient and friendly and really, if it wasn’t for her we may have left. We are also disappointed with the menu. Again there is no vegetarian option other then a pizza, which is one of the main reasons we don’t have dinner at Karinyas, Prehaps more vegetarian options could be something you could look into. We were also bemused why there was a lady vacuuming around us and around other tables with guests, whilst at the same time we were eating. Surely, there are other appropriate times this could be done, like when lunch is finished. At one stage when one of my guests visited the bar area she asked if she could move the vacuum so she could order a drink and was met with a stare and reluctance to move. So my guest had to step over the vacuum to order a drink. Also the drink she wanted was Aperol Spirit and there was none in stock to make an Aperol Spitz which is on your drinks list. Overall, if we were not residents, we certainly would not be back. We also do not recommend Karinyas to our other friends and family due to the constant short comings from this visit and previous visits. I booked the restaurant via online many days in advance of our booking. Its was a special event for our staff for our business and we requested a good table by a window/view. When we got there they couldn't find our booking as they had not checked the online bookings. We ended up in the middle of the room with everyone around. I felt very uncomfortable as it was a staff meeting. Wonderful meal on New Years Eve. Staff very welcoming & professional. Dinner & dessert were both very nice. We couldn’t be happier with the family lunch we enjoyed ar Karinyas Restaurant yesterday to celebrate my husbands birthday. We wanted a casual, relaxed experience and the Karinyas ombience and menu suited our needs perfectly. All the staff were excellent and so was the food, we do wish to thank Cheryl in particular for the cheerful, helpful way she looked after us. We’ll be back. The staff were so nice, helpful and approachable. The restaurant catered for my son's allergies. The chef even prepared a dish for my son to enjoy. The staff and chef were very mindful and understanding of my son's allergies. I definitely recommend dining in this restaurant. Booking was not there when we arrived. Tables were dirty and had to be wiped down even though it was 12.00 pm and not one person was in the restaurant. Food came quickly because I complained at reception. Half the table was cleared after the meal. We ordered coffees and the rest of the dirty plates were just left on the table. There was no interest shown at all by the 2 waiters. As a number of Gold Accor members we won't be coming back. The service was ??? ?when they were able. Except there waS a wedding so our meal took 1.5hrs and came out cold. After 1hr still nobody came to refill water or ask for another drink. I went and asked them. No lamb was really disappointing. No chicken either. What a great venue for a business lunch. Attentive service and quality food. Even though I booked they said I didn’t have a booking but they fitted us in. Great venue overlooking the golf course. Food was tasty & well presented - a very pleasant lunch - thanks!